Birmingham bin workers have suspended strike action as a "gesture of goodwill" for talks to take place. More than 300 workers started a series of walkouts over "secret payments" made to non-striking GMB staff after a dispute in 2017. Unite assistant general secretary Howard Beckett, said they were halting action for one day in a bid to break the deadlock. 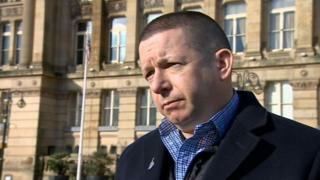 Birmingham City Council said it welcomed the suspension. The council and GMB previously said the payments were "properly made, for a failure to consult during the talks that ended the 2017 dispute". Unite said three days of talks at the Advisory, Conciliation and Arbitration Service (Acas) had failed to reach a deal to end industrial action. They added talks on Tuesday failed to "adequately progress" and rescheduling Wednesday's strike would give the council a chance to come forward with an "acceptable offer". Mr Beckett said: "Unite representatives cannot be on a picket line and attend Acas. "They have decided to reschedule tomorrow's strike as a gesture of goodwill to the people of Birmingham and to show their clear intent to use all efforts to reach a resolution." In a statement, Birmingham City Council said: "We welcome the suspension of the strike action by Unite and that they will be coming back around the negotiating table tomorrow. "It is in everyone's interests, not least the long-suffering residents of Birmingham, that the industrial action is brought to an end through a negotiated settlement before Thursday to avoid a decision being taken by the courts." Walkouts are still planned for 28 February and 4, 8, 12, 13, 21, 22 March.